About Us : Stereogram Images, Games, Video and Software. All Free! Our mission is to collect important information about Single Image Stereograms in one useful place and preserve it for the future generations. We working hard to let more and more people know about this amasing Digital Art. 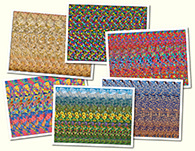 One of our targets is to teach seeing stereograms those who can't see them yet. 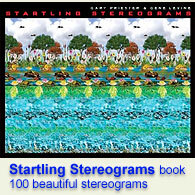 We love to share with you our great stereogram images, animations, games and tools. Most articles, stereograms, games and software presented by Dmitriy Bessmertniy (aka 3Dimka). In our Gallery you can also find artworks of Gary W. Priester. We do our best to keep this website is clean and easy to use. Check the menu on your left, it allows to access all main pages such as Theory, Gallery and Games. Our sitemap has links to all the pages of this site. Your donation will help us to keep this website up and running. You can also help us pointing errors and misspelled words in our pages.